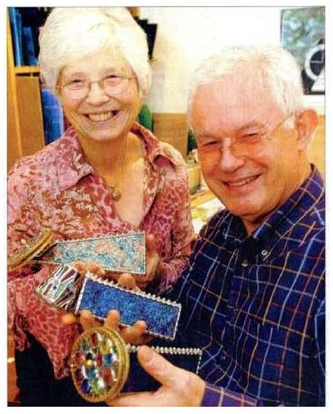 Cape Kaleidoscopes is proud to be the only USA retailer representing the brilliant work of Frank and Janet Higgins. The Higgins operate the United Kingdom’s only studio dedicated to the design and creation of kaleidoscopes. They brought nearly twenty years of experience in glasswork to bear in developing their unique craft which embraces techniques of stained glass, lampworking, glass-blowing and fusing, allied with precision optical glasswork. The Higgins create high quality instruments, which produce spectacular images while at the same time being pleasing externally. They are designed to last a lifetime. As their output is not large, kaleidoscopes made by the Higgins will remain rarities. Their work won three awards at the international exhibition “Kaleidoscopes 200 years” in Washington DC.